Having a food allergy can be very scary, especially for people who might have a severe reaction to a food allergen. Peanut allergies are among the top 8 allergens facing millions of Americans. And for many of those who are allergic to peanuts, they are at risk for an anaphylactic response, which is a life-threatening reaction. For this reason, it is critical that people with a peanut allergy follow a peanut-free diet and are always equipped with an auto-injectable epinephrine pen. Being an avid ingredient label reader is essential, but so is keeping your eye out for new products that may be harboring hidden or unknown sources of peanuts. Today, manufacturers must label foods that contain peanuts, according to the Food Allergen Labeling and Consumer Protection Act (FALCPA) rules. Peanuts and peanut ingredients must be clearly expressed on the label. For those with a peanut allergy the statements “may contain peanuts,” “contains peanuts,” or "this product was produced in a facility that also processes peanuts" are an essential way to help you identify foods that may put you at risk for your allergen. It is very important that people understand that when it comes to food allergies, it is never safe to assume something is safe without checking it out and investigating all of the ingredients. This is especially true with unfamiliar foods or new foods that come to the market. While a food at first may appear to be peanut-free, it is not always the case. You might be surprised to learn that many food and non-food manufacturers use peanuts to enhance their products. For instance, because peanuts are a legume and a source of protein and fiber, it may be used to thicken sauces or soups, boost the overall protein content, or used to enhance the flavor of food. Being familiar with the so-called "code words" that highlight the inclusion of peanuts in a product is critical to a person's safety. To being with, anything that includes the word “nut” or “peanut” should be reviewed more clearly to be sure you understand the ingredient list. However, some words aren’t as clear-cut, such as chili for example which requires an increased awareness and knowledge to navigate that the food is safe. Artificial Nuts: Hearing the term "artificial" might lead one to believe that there are no actual nuts contained in this item at all. However, don't let this title mislead you and make you think it is safe to eat. In most cases, "artificial nuts" actually contain nuts, so don't take any chances. Add this to the list of foods to avoid if you have a peanut allergy. Beer Nuts: No, these nuts are not made from beer! These are actually made with peanuts, and flavored with a sweet and salty glaze. They are called beer nuts because they are marketed to be eaten as a snack when enjoying a beer. Earth Nuts: By calling thee "earth nuts" this food might appeal to someone who is eating “clean, green, or close to the earth.” But buyers beware, as earth nuts are actually any nut, seed or fruit grown in the ground. So the reality is, these nuts may include peanuts, as they are grown underground. Mandelonas: The “faux-nut,” (fake nut) are actually peanuts that are de-colored, de-flavored, and soaked in almond flavoring or another flavoring like pecan or walnut. The flavored peanut is then remolded to resemble the nut it is trying to resemble. Mandelonas are a cheaper option over pricey tree nuts. Chili: The “secret” ingredient in many types of chili is peanut butter. It may be used as a thickening agent or a flavor enhancer. Be particularly careful with restaurant chili or prepared chili, and be sure to ask about the possibility of peanuts or peanut butter as an ingredient. Crumb toppings: Peanut butter may serve as a binding agent in a crumb topping, holding the ingredients loosely together and offering a nutty flavor. At other times pulverized nuts may also be included in a crumb topping blend. Graham cracker crust: Similar to crumb toppings, peanut butter may be included in graham cracker crust recipes to bind and hold the crust together, especially in no-bake recipe versions. Hydrolyzed plant or vegetable protein: Watch out for this ingredient, which is often found in imported foods, as they may be made with peanuts. In the U.S., hydrolyzed plant protein and vegetable protein are typically made with soy. Marzipan: This is a nut paste made from almond meal, honey, and sugar. 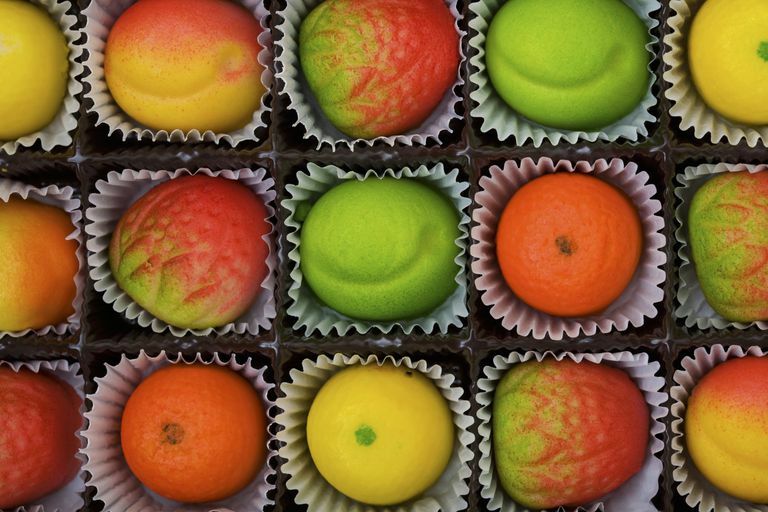 Marzipan is easy to shape and color with food coloring. It’s used as a decorative element on cakes, cookies or as colorful, shaped candies. Peanut marzipan or mazapan, comes from Latin America and is similar to marzipan but it is made with peanut instead of almond. Mole Sauce: Common in Mexican cooking, mole sauce contains a variety of ingredients and spices, including chili peppers. It may be thickened and flavored with ground peanuts or peanut butter. Natural flavoring: Another potentially misleading term is “natural,” which may be interpreted as allergen-free, but this is not necessarily the case. Natural flavoring may contain peanut or any other flavor made from a natural source. The Food Allergen Labeling and Consumer Protection Act (FALCPA) of 2006 requires the top 8 allergens to be declared if included as a natural flavoring. Energy Bars: Protein bars have become a main staple for many people, not just athletes looking to eat more protein-rich foods. These bars often use peanuts, nuts or soy to help boost their protein content. Peanut or peanut butter are typically a popular flavor option. Additionally, cross-contamination may also occur during the manufacturing process of these bars. Peanut allergies are truly something to take seriously. Being familiar with hidden sources of peanuts in food products, along with other non-food items, can save your life.